Allegedly, the genre is called “Gothabilly” – a term which I did not encounter until I recently took a look at my OMI-Profile. :) I think there is a certain similarity to Tito & Tarantula – although I do not really know this band. 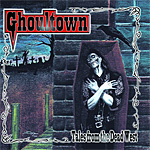 Unfortunately, I listened only to one CD of Ghoultown, their debut Tales from the Dead West. I don’t know if the newer albums are as good or even better. Confusingly, there seem to be different versions of Tales from the Dead West. I have the version of the year 2000 which has 10 Tracks. The German branch of Amazon lists a version from 2002 which contains 15 tracks and one video. It also contains Ten Seconds To Blood which was together with Killer in Texas my first contact with Ghoultown. Sadly, the CD is hard to find in Germany and it is also not in the repertoire of Last.fm. The only place to get a few samples that I know of is CD-Baby.